A recreation of the Uncle’s takeaway logo. The slogan used here was first trademarked in 1973. Recently an Iranian scientist claimed to have invented a time machine that he says will work with 98 percent accuracy (I question the legitimacy of his qualifications, as well as his sanity). Shame about the two percent that doesn’t work, and delivers you to somewhere you never intended to be going – like into an industrial revolution era cesspit, the jaws of a Tyrannosaurus Rex, or even worse – back to third form P.E. class. Anyway, if it’s true – the first thing I am doing is going back to Uncle’s in 1978 for a Sea Dog and a spearmint milkshake in a “Longest Drink in Town” cup. 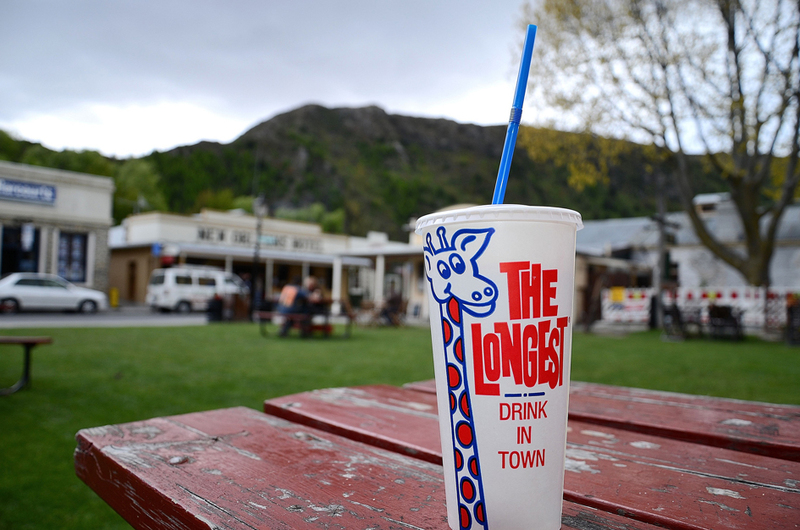 The Longest Drink in Town photographed in Arrowtown, 2012. Image courtesy of super jiani on Flickr . Where I grew up was not known for very much of note; the tinsel Christmas tree factory, those hideous sugary Spaceman drinks, and Maurice Gee (one of these things is not like the others). However, as research progresses I find out other things that people were unaware of at the time, that in retrospect, seem actually kind of amazing. Yes, we knew Tegel chickens processed birds there because we saw it (and smelled it) every day on our way to school. One popular thing to do was to take a discarded chicken claw and put it inside the cuff of your school jumper and pull the tendons so it was reanimated as you chased screaming girls around the sports field. Personally, I never did this because even I’m not that disgusting. I digress. How could we have never realised that the Spaceman Drinks factory was just a couple of streets away? This is something that was so important that it should have been common knowledge of every school-age person. A spearmint milkshake-inspired recreation of the cup graphic, apparently first produced in 1968. Today I’ve made a new discovery; a company named Huhtamaki Henderson, like Spaceman also in Keeling Street, designed and made that mainstay of takeaways across the country – “The Longest Drink in Town” cups. Huhtamaki, a global company established in 1920 and based in Finland, has custom designed and manufactured food service products in New Zealand since 1939 when the original business was started as Carton Specialties. Over time they have acquired several other brands and manufacturers like Chinet, Polarcup, Interpac, Van Leer, Insulpak, and also the Lilypak group – which was taken over in 1988. I am sure many remember the Lily paper cups with their chain of simplified green leaves around the rim. Huhtamaki have now been on the same factory site in Keeling Road, Henderson West Auckland since 1962 (as well as now in New Lynn). The “Longest Drink in Town” cup is said to have been first produced in 1968 (although multiple sources quote this date, there’s no actual factual evidence of where this information comes from, and the trademark registrations only say 2006). Now considered true Kiwiana (although a quite similar, but less stylised design may have originated in Australia in the 1960s) The spotty giraffe is these days more popular than it’s ever been – being produced as a variety of merchandise such as plastic cup sets with a plastic novelty carton-shaped “jug”, paper versions for parties, badges, height charts, cushions, clothing, greeting cards, magnets, tea towels – and even a range of actual milkshake syrups (chocolate, vanilla, banana, lime, strawberry, raspberry, spearmint and caramel ) formerly produced by Tip-Top and now made by Delmaine. 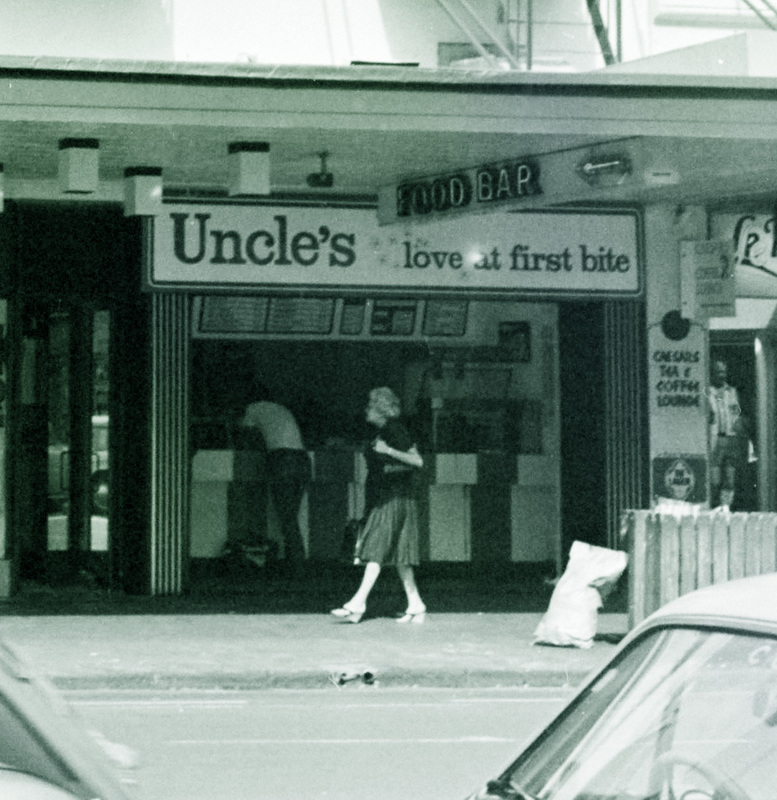 Uncle’s was a small chain I think contained to Auckland and surrounds, that many here will have fond memories of. It was established around 1970 and had two branches in Great North Road I can recall. They had a distinctive American style general theme with bold red, white and blue stripes, which again riffed off the Rocker revival of the late 1970s-early 1980s I mentioned in my previous article. With movies like Grease, and TV shows like Happy Days, this trend filtered into ads for Bluebird chips, Sparkles candy, and products like New American ice cream, Bazooka bubblegum and Frosty Boy. Left: vintage Lily cups, probably 1970s. 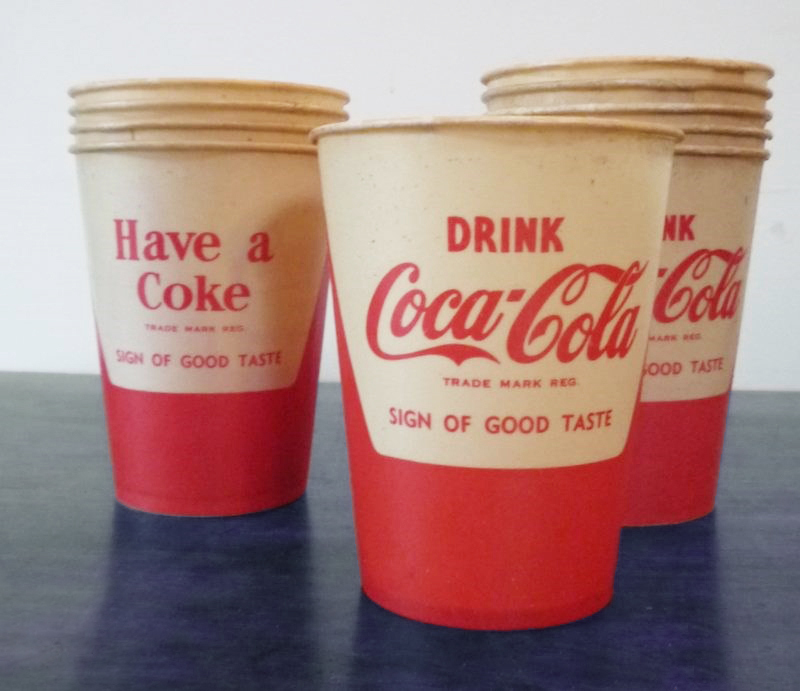 Middle: wax paper Coke cup by Carton Specialties of Henderson, probably 1960s. 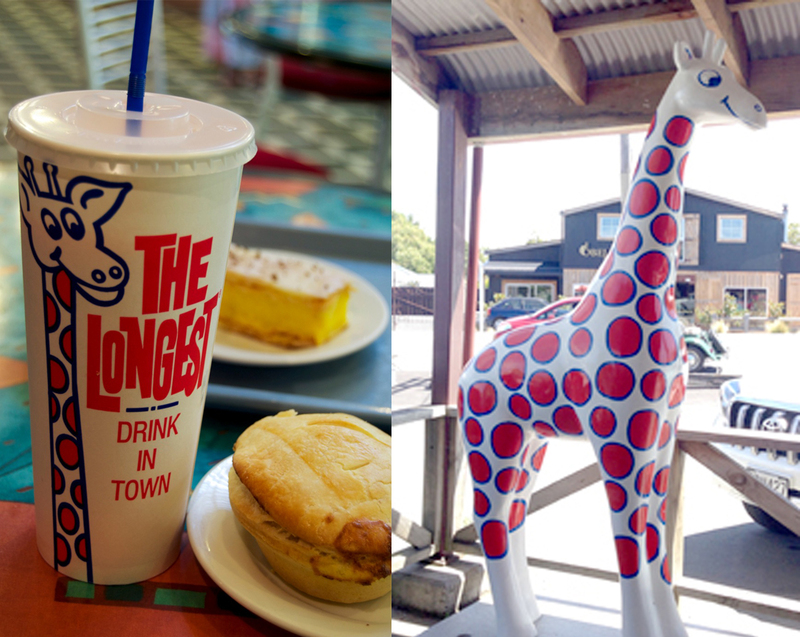 Right: A Longest Drink paper cup purported to have been manufactured in the 1960s, in Australia. 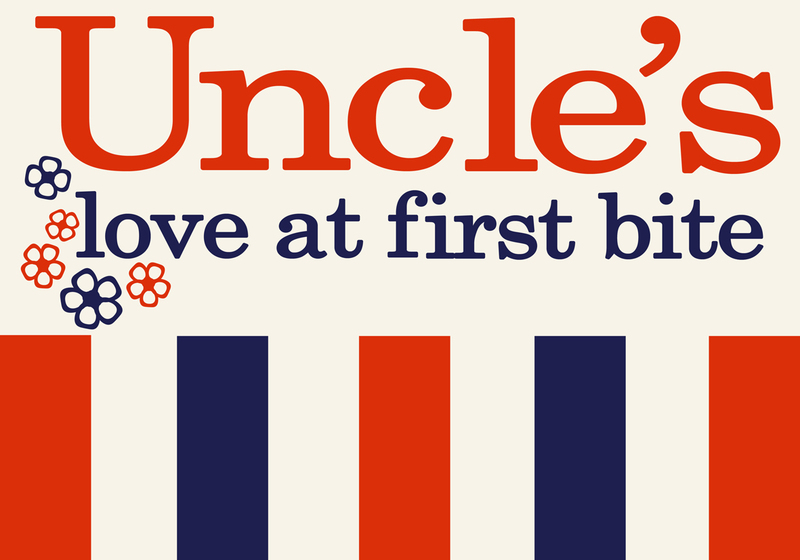 Uncle’s Group (New Zealand) Limited changed their stripy logo to a big, tri-colour “U” around 1986 but it’s the “love at first bite” slogan with a bizarre sprinkle of stylised flowers (why not hearts, I’ve always wondered?) I have reproduced here at the top of the post, which first appeared in 1973, and that will be familiar to most. Back in the day when it wasn’t necessary to be everything to everyone, Uncle’s kept it simple with basic old school burgers, chunky chips with tomato sauce, and milkshakes. They also made something unusual for the time – hot dogs. A variation was the Sea Dog, which as far as I recall had fried battered fish instead of a frankfurter, with tartare sauce and fried onions (correct me if I’m wrong). Seemingly Uncle’s was still operating in the early 1990s but I don’t know what happened to it; Like Georgie Pie it was probably driven out by the golden arches. 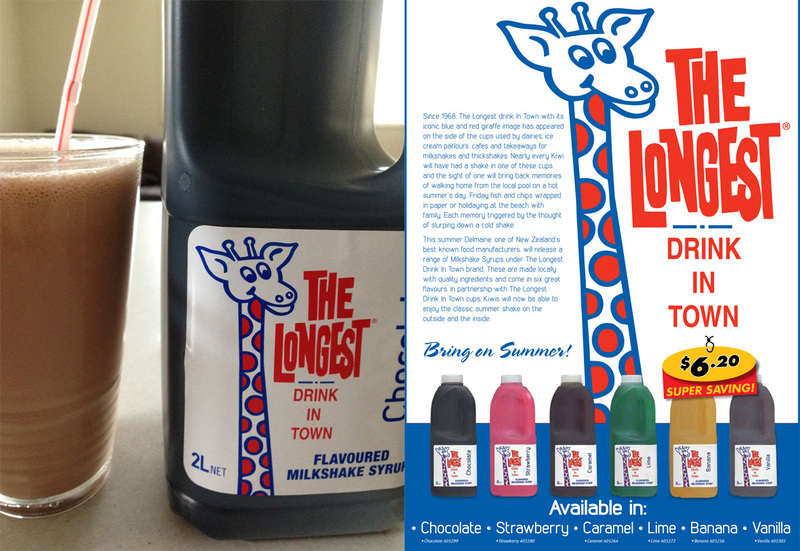 Left: Longest Drink in Town chocolate syrup, image courtesy of the Bee Sprinkles blog, beesprinkles.com. Right: Advert for the range of eight Longest Drink in Town syrups by Delmaine. Image courtesy of Trents Wholesale catalogue 2012. Speaking of which, and expanding on fast food history firsts in the local area, we got the first Georgie Pie in New Zealand up the road in Kelston in 1977, and by 1979 had the fifth McDonalds in New Zealand in Henderson Square (maybe not something to be proud of now – but it was exciting at the time). For some reason I had the idea it was the “first” something or other – and I suspect it was the first McDonalds in a mall – even though it also had a separate entrance from the outside. Generally fast food chains in New Zealand deserve their very own article, though. However it’s interesting that right where I grew up played a significant part in the history of junk snacks on a number of counts – and many of us never knew it. Addendum mid June 2015: Quite soon after I posted this article, maybe even because of it, someone dredged up this photo out of the Turnbull archive. It would have taken me an awful long time to find it, probably when I only ran over it by chance some years down the track given the subject focus is Queen’s Arcade – not Uncle’s. I think that person was probably Auckland historian Lisa Truttman from Timespanner (see blogroll on right of page), so thanks for this, Lisa, if it was you. Image of Queen Street, April 1982, courtesy of Alexander Turnbull Library, ref WA-76015-F.
Addendum late October 2015: These wax paper Coca-Cola cups came up for auction recently. This is a better image of the same posted above, very likely made by Carton Specialties of Henderson, probably in the 1960s.